It’s planning time on The Mountains Novel. 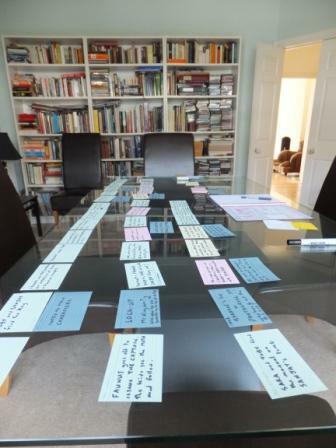 I have the scenes spread out on cards and the dining table is out of bounds (see Two authors in the house). At the moment I’m taking a hard look at the set-up chapters. Of course I’ve got my own spider sense, but it’s rather fun to have a guide to remind me of what I might not be seeing. (And what I might be ignoring because, well, to change it would be inconvenient.) So I’m sharing the fun with KM Weiland’s rather useful new book Structuring Your Novel. Today, she is reminding me what I need by the first plot point, roughly a quarter of the way through my story. I need to establish where the story takes place, what era, what special things might be interesting or significant about the world. A setting isn’t just any old backdrop. It’s the perfect resonant environment for themes and the characters’ plights. I’m making sure my beginning gives inklings of this, while still seeming entirely natural. By the end of act one, I need to have the major characters established. The reader must know who they are, what makes them individuals (and distinct from each other), what their beliefs and dilemmas are, where the instabilities and disturbances might be in their lives. Even if I’m going to reveal more later, I have to give the reader enough to provoke their curiosity. By the end of act one, the reader needs to understand what the main characters want. Perhaps they want to solve a crime or murder their uncle. Perhaps they want to stop their family finding out about their secret life. The reader must also understand why this is so personally important – and what failure will cost them. This is the other half of making the story matter. There’s quite a lot of background to establish, but it must be done – as much as possible – with scenes that advance the plot, rather than pages of explanation. Back story is important, of course, but we need to earn the space for it. Deploy back story only when the reader is hungry to know. The story’s ending must resonate with the beginning. Perhaps it answers a question, solves a problem, resolves an imbalance. But if the seeds of the end aren’t in the opening, it will not be so satisfying. Just as I have all that bubbling, I have to push the story over a point of no return. The characters make a choice, cross a Rubicon. Perhaps disaster strikes – and that dreaded event becomes reality. Why is this a quarter of the way through? As Katie points out, readers – and moviegoers – have an innate story clock. No matter how interested and enthralled they are, if you don’t shift the goalposts at a quarter through, they’ll feel the story is slow. Right. I’ve got some fine-tuning to do on the beginning of The Mountains Novel. If you follow me on Twitter you’ll know that KM Weiland is one of my favourite writing bloggers. Her book is as clear and wise as her blog posts and I recommend it – whether you’re writing beginnings, middles or ends. In the meantime, tell me: what stage are you at with your WIP? This entry was posted on September 1, 2013, 1:29 pm and is filed under How to write a book. You can follow any responses to this entry through RSS 2.0. You can leave a response, or trackback from your own site. Thanks so much for the amazing post, Roz! So glad you enjoyed Structuring Your Novel. Best of luck with the WIP! My pleasure, Katie – great book! Roz, you and I are on the same page. Katie does such an excellent job of laying out each step of the novel, I use “Structuring Your Novel” as a road map. Once I’ve got my scenes laid out (in Excel first), I check her list of what that act or plot point should contain. I downloaded the Kindle version, but I may have to buy the print version for super quick reference. Hi Ron! All I can say is: I agree. It’s a great template for making sure the story has everything in the right place. Love the picture!! Great tips here! Jill – good to see you here! Does this mean TV meals because the dining room table is out of bounds? Kids love that! WIP – Should finish first draft within the next two weeks. Hi Cathy! Glad NYN is proving useful. Structure is magic. An event in the right place, for the reader’s inner clock and the story’s rhythm, keeps everything ticking along wonderfully. Yep, ‘Structuring Your Novel’ is brilliant, and distills it better than I’ve read anywhere! Of course, it leads to a perfect Outline and then First Draft … (in my head). So I think ‘Nail Your Novel’ is the perfect partner, to help clean up all the mess that Ms Weiland didn’t intend I make in the first place! When you, Joanna & Katie run a Writer’s Workshop one-day, please take my money from me now …. Hi Robert! Yes, the books do go together rather well, don’t they? Hmmm … a Penn/Weiland/Morris writing workshop … that would be fab. 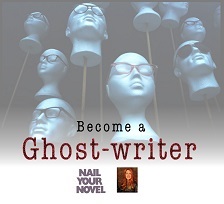 You know Joanna and I already have a multimedia writing course based on Nail Your Novel? It would be FAB indeed. My credit card is waiting haha! Just started reading Structuring Your Novel this week. Love this book! It’s good, isn’t it, Laurie? Hi Roz. It’s fun to get a glimpse into another writer’s story planning process. Thanks for sharing that. I’m just finishing up story planning myself and starting on the first draft this week. I haven’t seen “Structuring Your Novel,” but I’ve read several other books on story structure. I’m always on the lookout for new ideas, so I’ll go put SYN on my wish list now. My process is more virtual than yours. I use a spreadsheet for my beat sheet rather than physical cards. The book I’m planning now is the third of my trilogy, so I have several long-standing story-arcs to wind up. It has proven to be quite a challenge. I use the spreadsheet to coordinate the timing of the significant events in each plot thread. The phase titles are just general guideposts relating to the main plot. Sub-plots develop and resolve on their own schedule and weave into the main plot at strategic points. Some even follow the same pattern as the main plot because they are closely related. For example, the antagonist’s actions drive the forward motion of the story, and the protagonist’s character arc reacts to the main plot developments. I needed this tool because the beat sheet didn’t give me a good enough sense of the interrelationships between sub-plots. The plot loom made it much easier to add scenes to my beat sheet in the correct order. Hey Daniel – I like your distinctions there! That marries nicely with Stuart Horwitz’s ‘Blueprint Your Bestseller’, which helped me break apart the various plot threads (‘Series’ in his nomenclature) and see the individual rising/falling action. I liked the idea that a ‘key scene’ is when several of the most prominent Series interact. I used this concept, together with Roz’s ‘Beat Sheet’ to improve my children’s novel, and immediately spot where there were gaps. Thanks for the tip on the Stuart Horwitz book, Robert. I’ll have to check it out. I like the “key scene” concept too. I think key scenes were some of the details I was trying to nail down with the plot loom. I used a beat sheet on the first two books of the trilogy and loved how it worked for me, but this time, I needed to see the sub-plots laid out against each other in a horizontal time line. Now that I see how it all fits together, I can more easily build my beat sheet at the scene level. I suspect my project management (e.g. Gantt chart) experience influenced the concept. The main plot line is the “critical path,” and the other threads weave into it in parallel. Hi Daniel – yes I can imagine with bigger works too (especially fantasy world, where the setting itself is effectively a ‘Series’) there is so much to keep track of. I must have done a similar, but simplified thing – I did a beat sheet, using labels etc as per Roz’s method, which in an of itself was hugely valuable, then I also used Horwitz’s ideas – added extra labels for memorable vs weak scenes; and ‘key’ scenes. I’d already listed all the different ‘Series’ in the book and priortised them as he recommended. This was helpful as what I though might be a ‘central series’ in fact wasn’t. In his model. the central series is the one a reader depends on to anchor them to the story. Not necessarily the main plot, though it could be, it could be an environment or a place returned to again and again, or a character. Then with all this mess on my beat sheet, I hand-drew a simple graph following each important Series; with one axis the story unfolding and the other (in my case), rising/falling excitement/tension. It was then obvious from this combination of the two techniques exactly where there were major problems (eg key scenes with insufficient excitement; a lack of tension prior to a key scene; and even a Series that failed to resolve!). But this was all post-first draft. Having now read ‘Story Physics’ (well worth it but lumbering) and Dwight Swain’s ‘Techniques of the Selling Writer’ and then recently ‘Structuring Your Novel’, I think the latter trumps the other two, being succinct and usable. So the combination – to not derail your post any more Roz, sorry! – of Nail Your Novel and Structuring Your Novel is a terrific shortcut to learning for newbies like me. I’s throw in Horwitz’s book for his nice a take on how to thread through various ‘Series’ and make a more complex story even more powerful. His use of “The Ugly Duckling” as a working example is excellent; and the book is FUNNY. As always Roz, great discussion popup here, so thank you; and your comments Daniel are always detailed and insightful, I Ireally appreciate them. Hey guys! What a brilliant discussion here (while I was in the land of nod!). Daniel, I love that idea of the plot loom – setting each thread out in a visible way and then checking how it rises and falls. 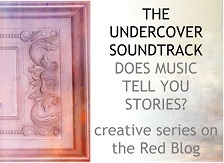 I had a similar idea in Nail Your Novel, where I suggested using music staves, because you can see a rise and fall. Though you’ve gone into it in much more detail – and I think that’s really useful. I’m also using coloured cards for different characters’ threads. They will of course come together as time goes on, which leaves me dithering about which colour to use – and is why Daniel’s solution is more elegant. This is an easy one to make and one I’ve seen even experienced writers make. I’m halfway through editing my novel at the moment and have cut out 5,000 words so far – I wouldn’t be surpised of 75% of that is the removal of unnecessary exposition. Hey MGM, you’re right. When I had my novel in its late editing stages the one comment I got from my editor was ‘move that chunk of back story’. We spend so long thinking ‘the reader simply needs to know this to understand the story’ but actually they don’t. It’s like when you meet a new person. Until you’ve bonded with them you won’t be familiar enough with them to be interested in their back story. But once you’ve have, you’ll be eager for it. Hi, Roz. I have read your article and it is very useful to me. I am a writer. I am still taking writing classes. These advices help me a great deal. Thanks! Hi Roz! 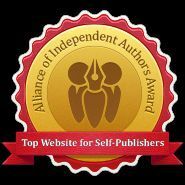 Having read and admired its exhaustive structural drilling down from story via scene to paragraph and sentence, I’m happy to add my shout out for Structuring Your Novel. As to what stage I’m at with my WIP, I’ve finished the first draft of 2084 and am letting it cool before further rewriting. As you know, your seminal novel, My Memories of a Future Life, was a powerful inspiration for the futuristic 2084 and got me posing the Dramatic Question that fuelled the plot and turned the whole thing into a Three Act Drama (to use Katie Weiland’s excellent terms). To continue the theatrical metaphor, the drama is currently on a provincial tour (getting reader feedback from the chapters I put out on Wattpad and Microcerpts) before I take note and tweak scenes, dialogue and stage directions/descriptions, plus take a hard look at the climax (that’s meant to have readers on the edge of their seats a la Weiland). Hopefully, after the requisite fine-tuning, 2084 will be ready for its West End run. Hi Trevor – nice to see you! Crumbs, what has my novel started…? I should probably try to remember which books I could blame it on, but alas my memory isn’t that good. Perhaps I need hypnotherapy.